Bloczki, rury, pręty, blachy, itp. 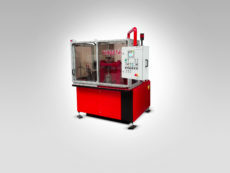 TERMETAL offers equipment for induction surface hardening. Our equipment allows hardening of shafts, pins, sleeves, toothed wheels, chain wheels, rods, pipes and other items. Induction hardening equipment ensures high quality, repeatability and cost reduction of product treatment. Is also enables continuous, failure-free and safe operation. Many years of experience in the design and construction of surface hardening equipment allow us to meet the needs of different sectors of industry. The devices are equipped with generators of our manufacture with power of 30 kW – 500 kW and frequency of 500 Hz – 500 kHz. We design and create universal equipment dedicated for special applications. The range of equipment we offer for induction hardening includes universal units for hardening of shafts, toothed wheels and other items, as well as customized and high efficiency devices.